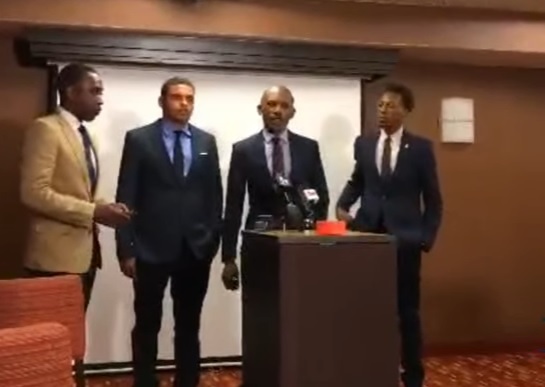 VIDEO=> REPORTERS Gang Up on DANNEY WILLIAMS at Presser: "You See How This Is Damaging the Clintons!" Danney said he has known about his father since he was 9 years old. Danney said the reports of a previous paternity test were inaccurate. The mainstream reporters are attacking Danney! His friends raised money for their trip to Las Vegas. Danney says Bill Clinton delivered presents to him when he was a child! LIBERAL REPORTERS CONTINUE TO ATTACK HIM! Danney says he knows the man who raised him is not his father! Danney told reporters Bill Clinton was his mother’s only white client at the time. Your heart really goes out to Danney. THAT WAS AN AMAZING PRESSER!!! Isn't it funny how Libs say that #BlackLivesMatter all the time..Until @danney_williams comes on the scene looking 4 answers? SHAMEFUL.